That set-up malarkey is classic Square Enix. The LotRO patcher is state-of-the-art by comparison. I looked at the twitch offer but I didn’t bother. 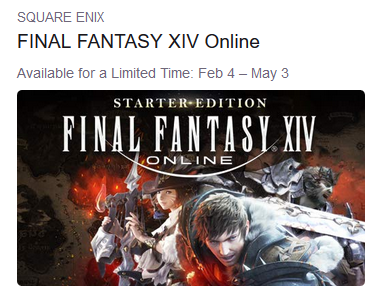 It’s probably worth it for anyone who has never bought any version of FFXIV, because it does give you the base game for nothing. However, it also only gives you one month of gameplay, after which you will have to stop or pay for a subscription, exactly as though you had actually paid for a copy. You can’t use the Twitch code to sub an existing, lapsed account for a month. I checked. I would have done that. You also can’t use it to convert a Free Trial account to the full, base game. I checked that, too. If you’re curious about FFXIV but don’t think you’d be likely to subscribe, you’d be better off with the unlimited-time free trial. That lets you play to level 35 with no noticeable restrictions and you can play indefinitely, not just for a month. I would say most people with mild curiosity would either know they did or did not want to subscribe well before Level 35. That said, these days almost *every* current FFXIV player, when asked, dismisses the base game as just something to get past as fast as possible to reach the real game, which these days seems to be reckoned to begin with the second expansion. The much-vaunted storyline, which people were raving about when there were no expansions, is now cited as not getting going until Level 60 0r so. This kind of retrofitting happens in most MMORPGs, of course. It would be very interesting to read your accounts of a trip through Eorzea, though, so I hope you do decide to give it a go. Maybe try installing the Free Trial and see if that runs? I don’t recall having too much trouble with that. I can only talk for myself, but I didn’t feel like there was a good narrative until final patches of ARR, everything before that felt like “primal of the week” kind of story with very little world building and character development. I was flabbergasted to read Aywren’s post about how she enjoyed 2.0 story more than LWS2 in GW2, which I found much better written and coherent. Kinda shocking you’ve never played it. Very much worthwhile IMO. I saw your post yesterday, downloaded client and didn’t have any issues with install. I’m on Windows 10 as well. Only problem I had was forgetting my ID, so had to contact support about that but eventually got everything and am patching currently. Now just have to figure out where people are playing. It allowed me to transfer a free trial account to full with the code. The main story certainly meanders a bit between the end of the base game’s launch content and the beginning of the first expansion (Heavensward), but I wouldn’t say it’s any worse than other games. The big difference with FFXIV is significantly more content is gated behind the main story quests and you can’t jump ahead to the start of a new expansion.